Big rigs. 18-Wheelers. Semis. Tractor-trailers. These giants of the American roadway have plenty of regional and local nicknames but one thing remains consistent: they form the backbone of the shipping industry in this country. The Las Vegas Valley is no exception. Between Las Vegas’ own explosive growth and the city’s proximity to I-15 a driver is never far away from one of these behemoths. Each year in the US 500,000 trucking accidents occur. 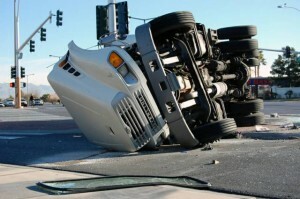 Defective Truck Equipment, such as lights, brakes and tires are contributing factors to semi truck accidents in Las Vegas. Trucking Company Negligence, where unqualified drivers are hired or a fleet of Overloaded Trucks and Unsecured Loads are put on the public roadway can create an environment in which innocent drivers and bystanders are put at needless risk of injury. Truck Driver Fatigue is another exacerbating factor in some accidents, when the truck driver is simply too exhausted to retain control of their vehicle. In a Commercial Vehicle Accident, if there is an injury, over 90% of the time the injury is to the driver/passenger of the passenger vehicle, not the truck driver. If you or someone you care about has been injured in a Trucking Accident, The Law Offices of Patrick Driscoll, LLC. can help put you and your family back on the road to recovery.